Historically, NEMTP changed venue from session to session. 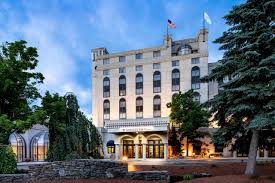 In 2012, it was determined that the DoubleTree by Hilton in Nashua, NH (previously the Crowne Plaza) was the ideal location for holding the event. Each track has the ability to vote on location but Tracks X and XI agreed to keep the location consistent, in Nashua, NH. This tab will keep tracks updated on the location if there are any changes. Our current fee for lodging is $159 per night. This can vary depending on the size of each track. Reservations are best made by phone so the room can be reserved within the block for NEMTP. It is not recommended to book your room through a travel or hotel website. You will incur the $50 per day hotel fee if you do not reserve through the hotel and the NEMTP block. For GPS, type in "2 Somerset Parkway in Nashua, NH"
DoubleTree sets aside a "block" of rooms for our group, but this depends on the members staying at the hotel. If you are local to Nashua or do not plan on staying at the hotel for the weekend, you will be charged $50 per night for conference incidentals. If you are sharing room with a spouse, there is only a $50 surcharge per night. The location of the final presentations will most likely be somewhere other than Nashua, NH. The group decides on this location near the end of the track.